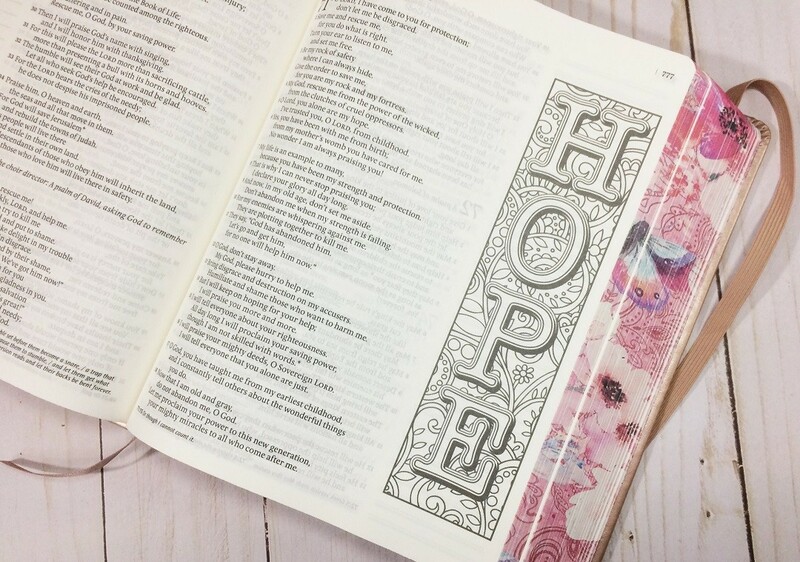 The newest addition to Tyndale’s popular Inspire Bible line is the NLT Inspire Catholic Bible. 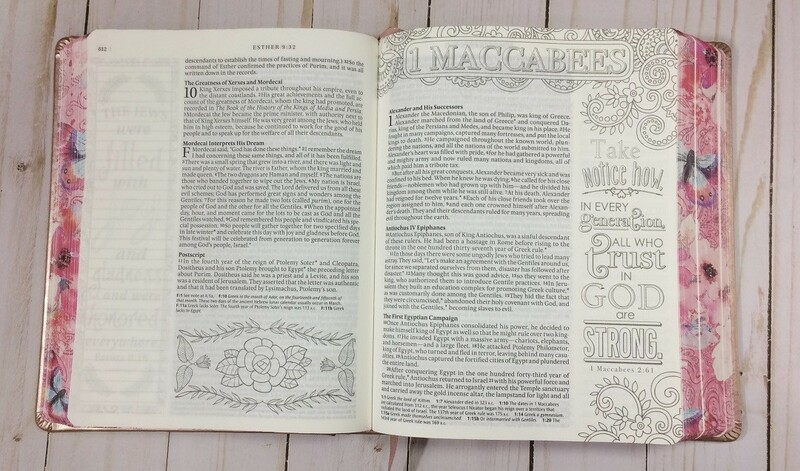 There are very few Catholic journaling Bibles and this is the first one to include line art for coloring. 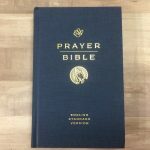 Tyndale provided this Bible free for review. I was not required to give a positive review, only an honest one. All opinions are my own. 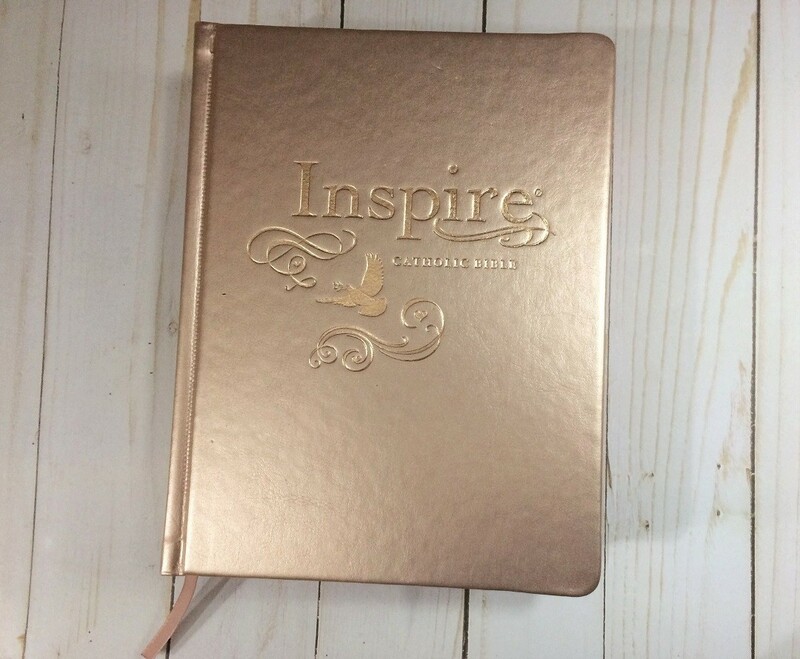 It is bound in a beautiful rose gold hardcover that measures 8″ x 6.5″ x 2″ and it weighs 2 lbs, 12 oz. The paper is off white and fairly thick (40 gsm). 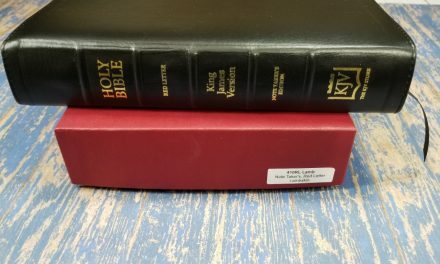 As with all Catholic Bibles, the books of the Apocrypha are mixed into the Old Testament instead of being placed between the two Testaments. 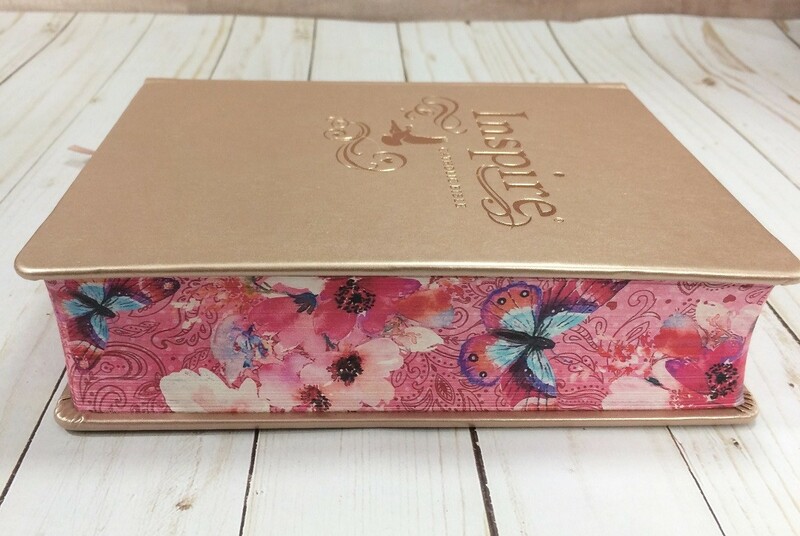 It has a sewn binding and butterfly and flower page edges done in multiple shades of pink with touches of blue and purple. 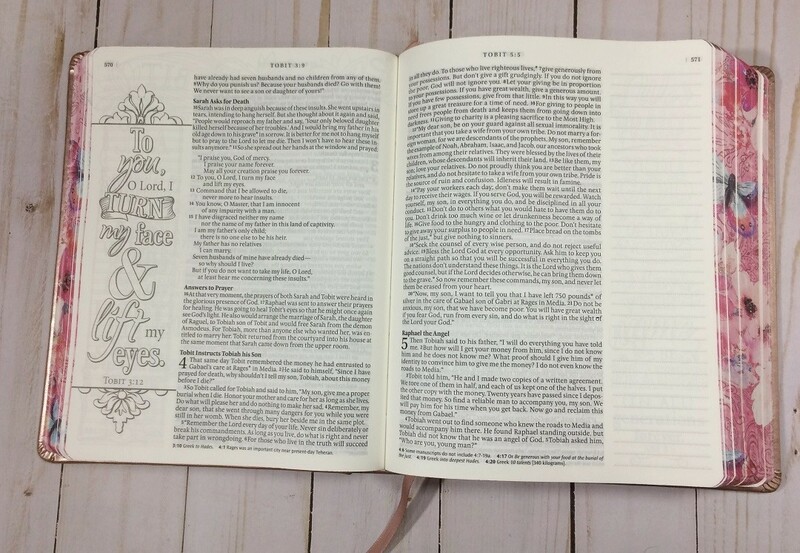 (I’m not Catholic so I won’t be using this as my new journaling Bible but I want a Bible that looks like this). 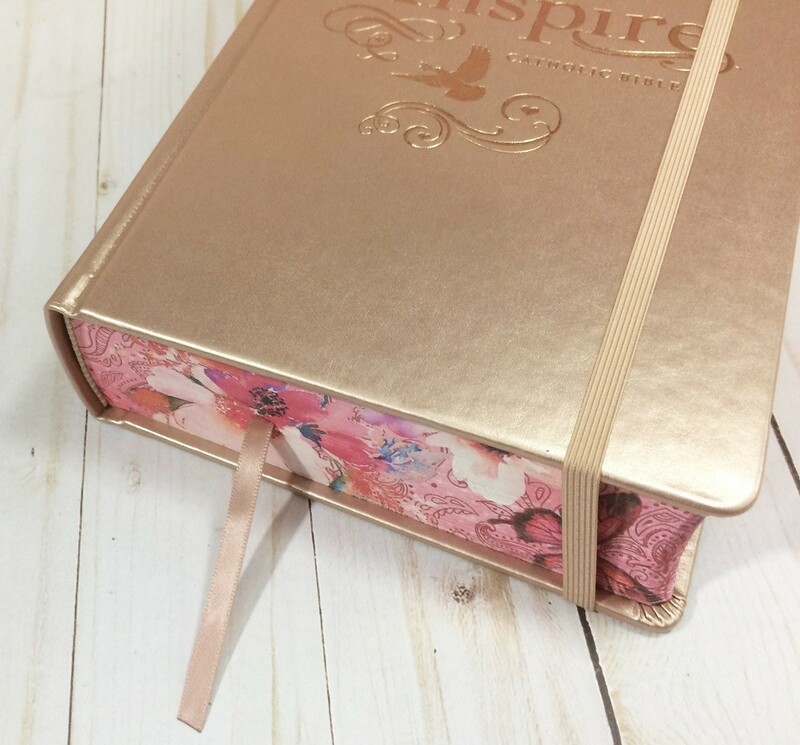 There is a matching rose gold ribbon bookmark attached as well as a matching elastic band to hold it closed while carrying and storing it. I find the elastic band helps smooth any page crinkle caused by art mediums as well. 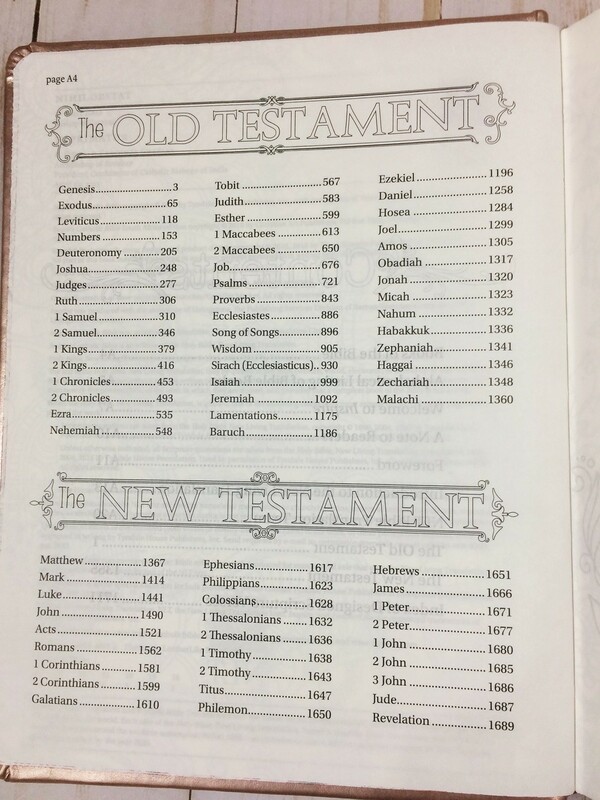 The text is set in a single column format. 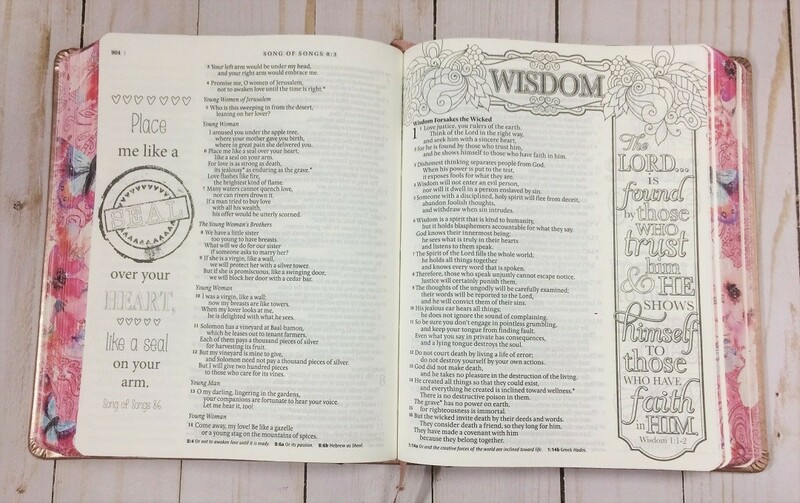 The poetry is set in stanzas and letters and quotes are offset to make them easier to find. 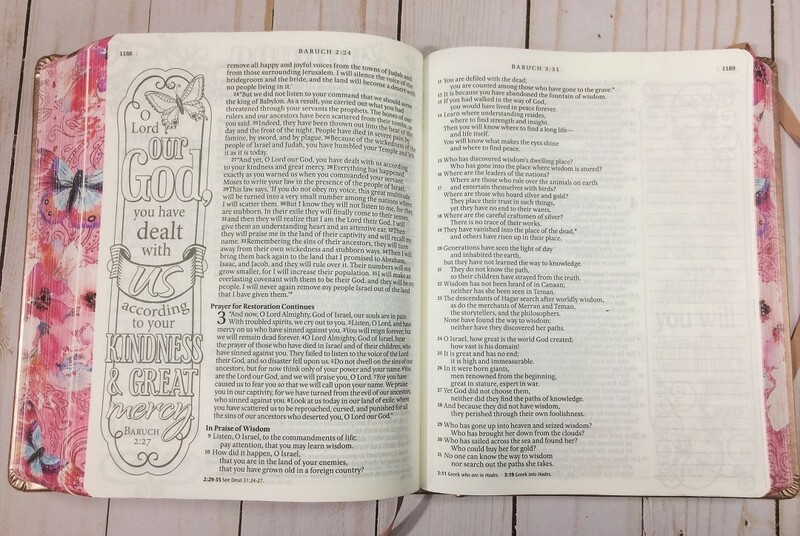 This is a black-letter Bible and the print has consistent darkness throughout the Bible. 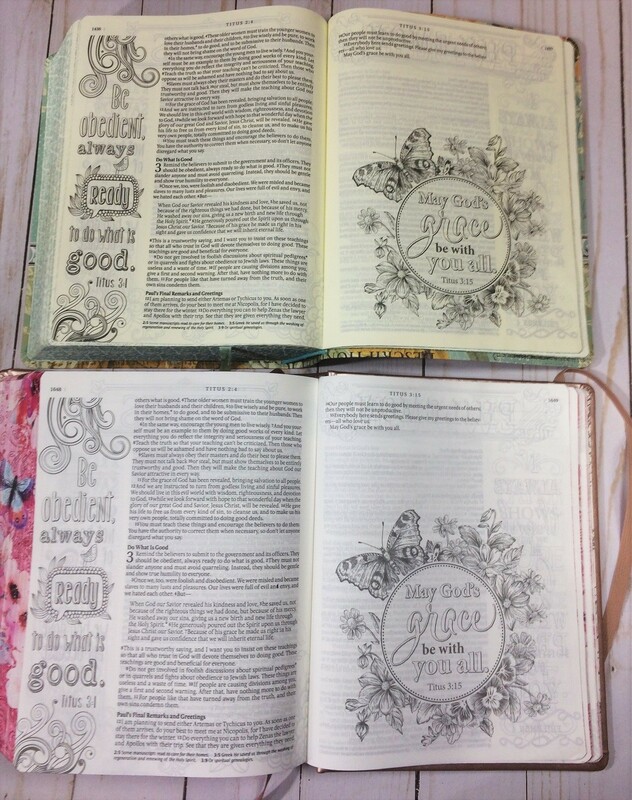 The margins are 2 inches wide and any that do not contain artwork have 36 evenly spaced lightly inked lines. 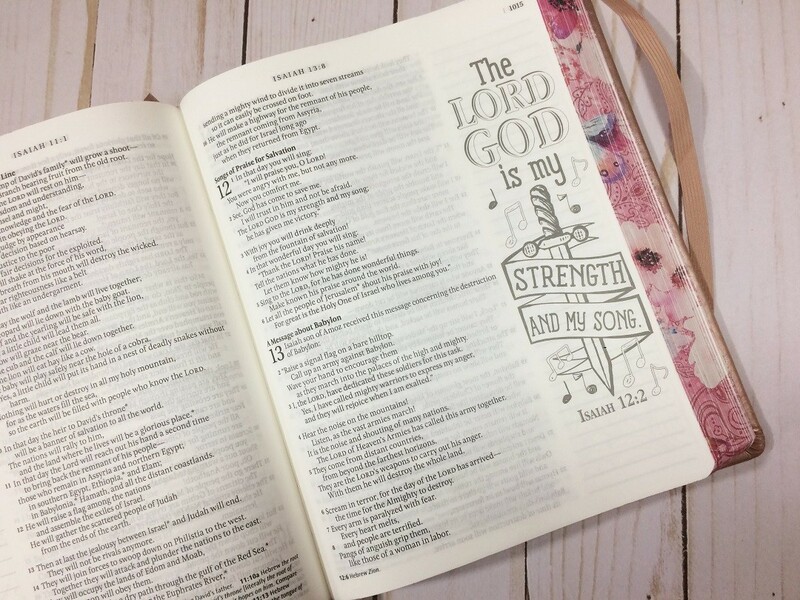 The lines aren’t dark enough to detract from most artwork you add yourself and come in very handy for notetaking or keeping hand lettering squared on the page. 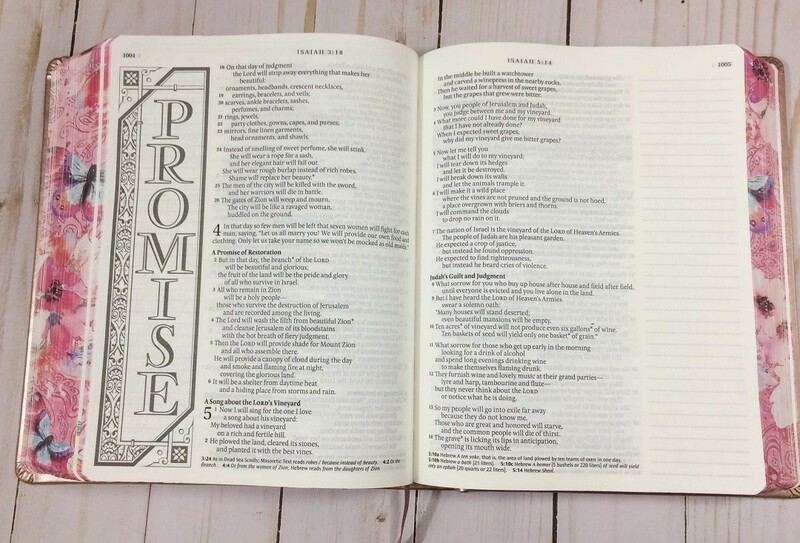 There is a reference verse centered over the text on each page and page numbers are found in the top outer corners. 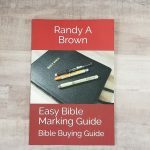 The introduction to the New Living Translation, names of the Bible translation team, and translation footnotes are included. 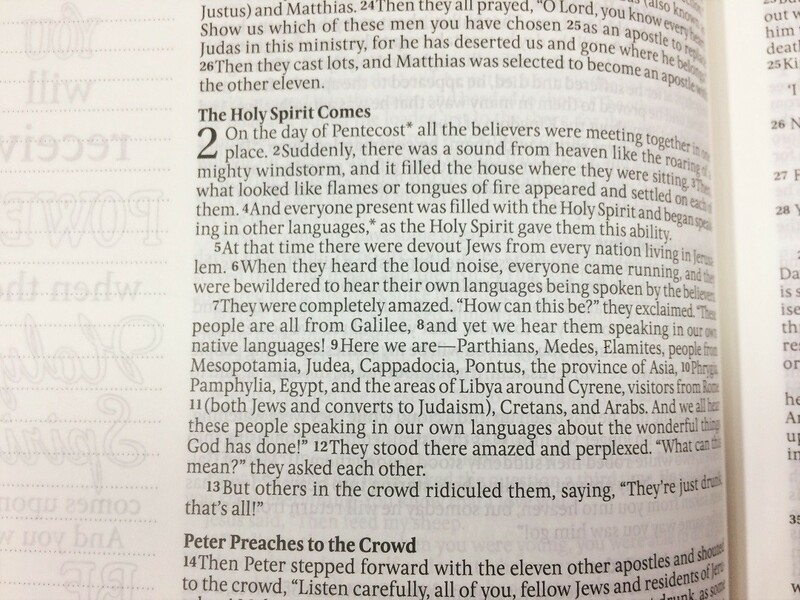 The footnotes have verse number references so you know which verse they correspond to, but the text itself only has asterisks to make it less distracting. 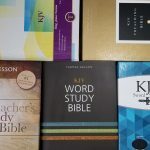 The NLT text has been approved by the Catholic Church for reading and study, and the official Imprimatur is included. 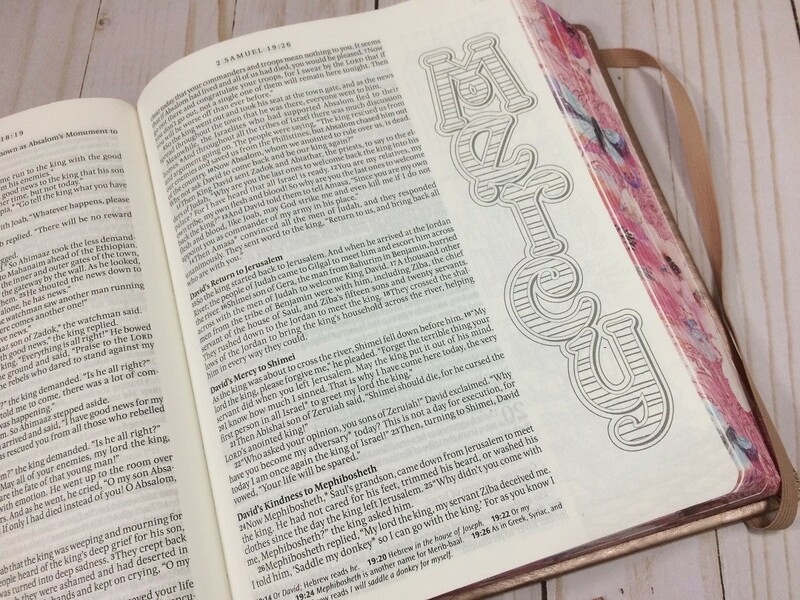 The Artwork is the major feature of any coloring or illustrated Bible and the NLT Inspire Catholic bile is no exception. It has over 450 line-art illustrations. 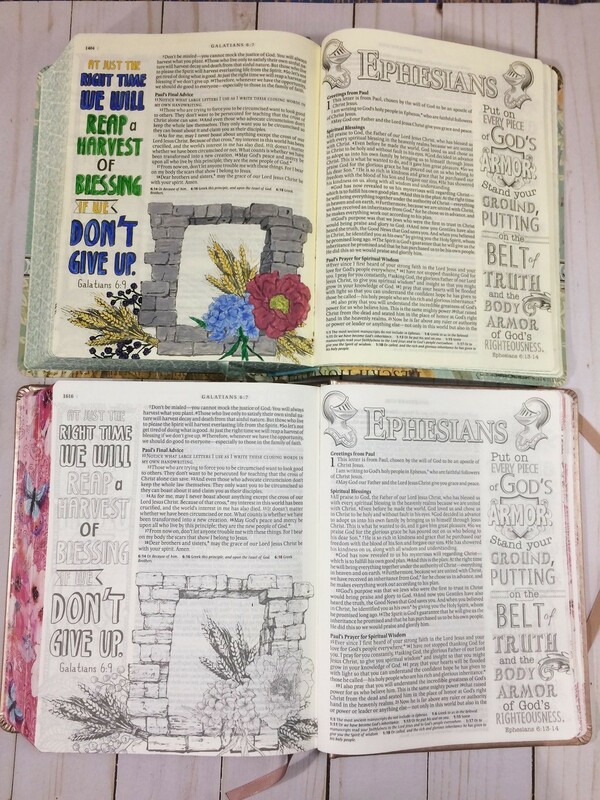 and lettered and illustrated Bible verses. 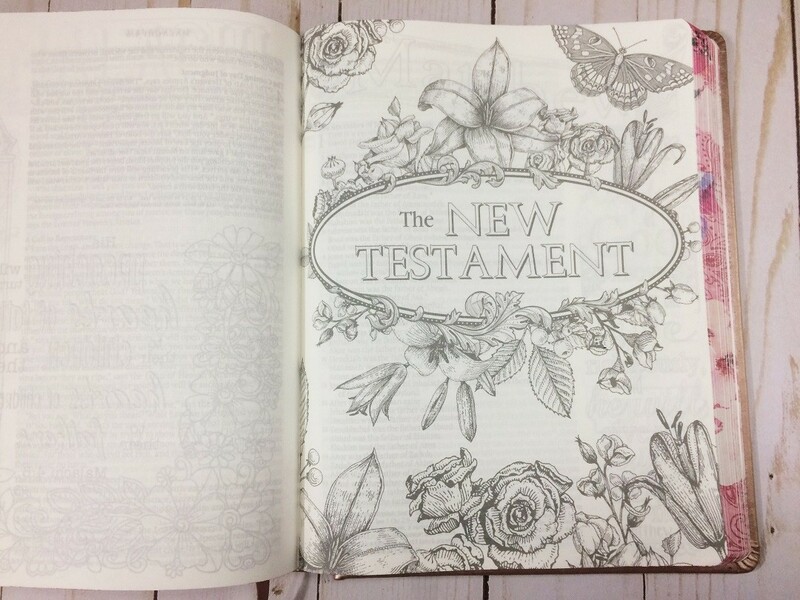 There are illustrations for the beginning of each Testament and the endpapers as well. 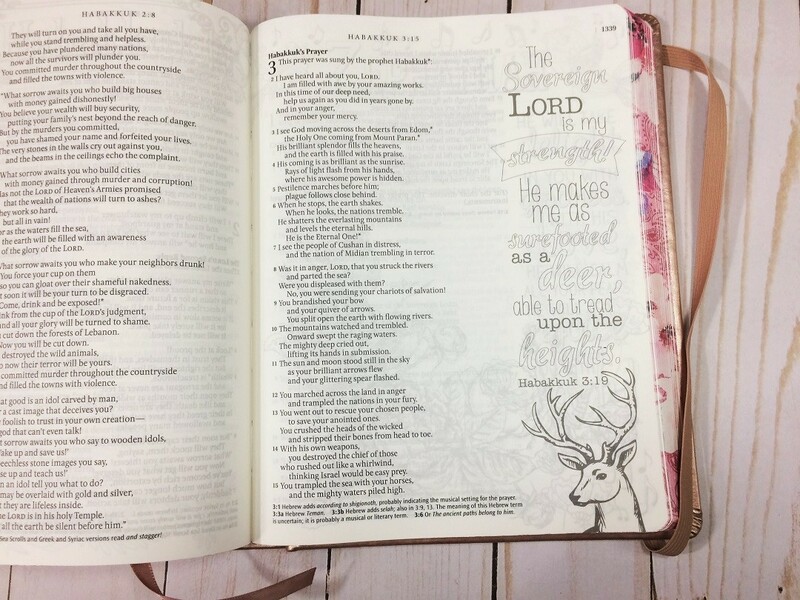 A large variety of art supplies should work well in this Bible. 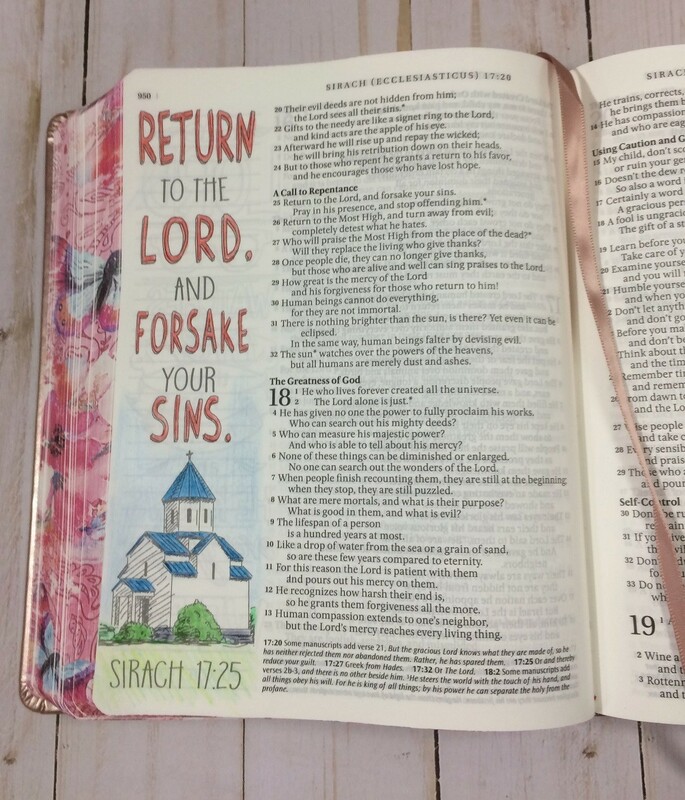 I did the following illustration with colored pencils, which is a good place to start if you are nervous about adding color to your Bible. Other mediums that should work well include full-bodied acrylics, watercolor (if you are careful about how wet you keep them), and Bible paper approved pens (like Pigma Microns). 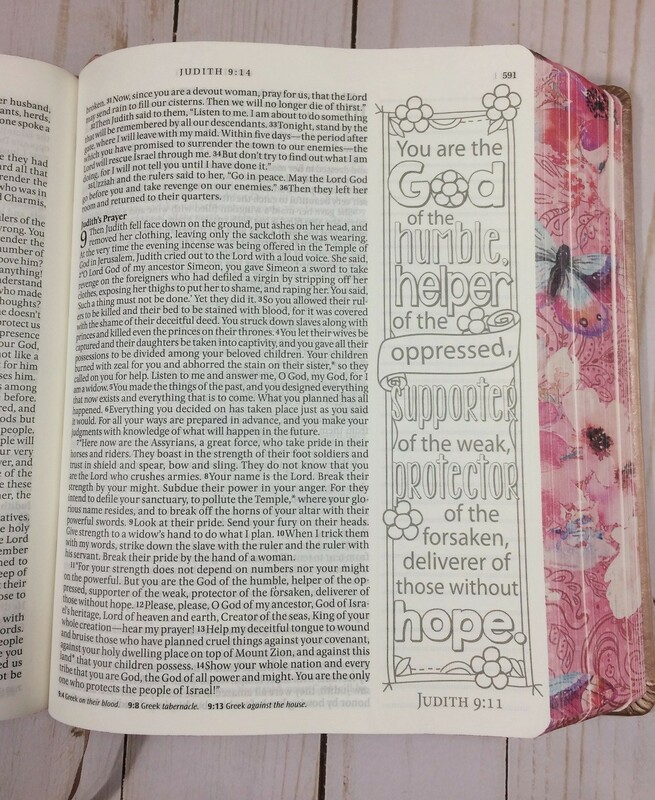 This is an example of full-bodied acrylic paint in my regular Inspire Bible and the corresponding page in the Catholic Edition. 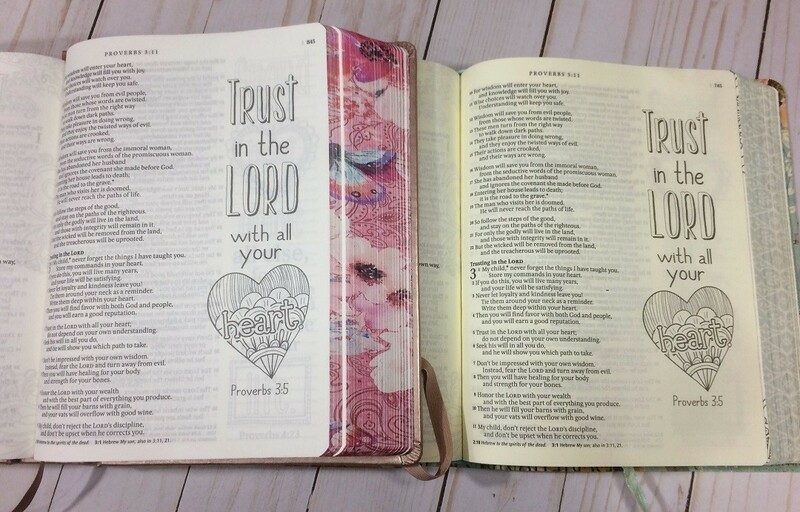 Most of the artwork found in this Bible is the same as what’s found in the first Inspire Bible with the addition of new artwork for the extra books. 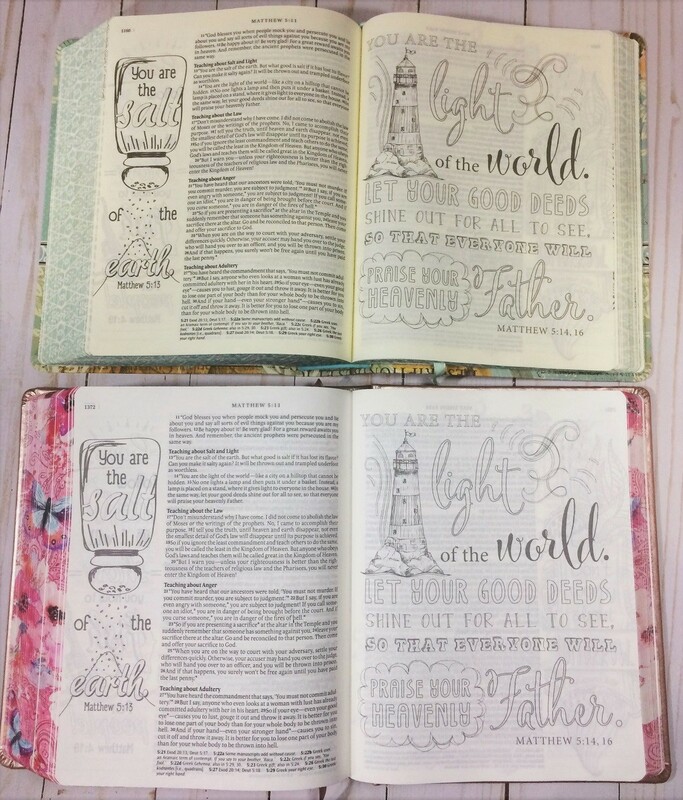 Here are a few comparison photos of the two, you’ll notice the original Inspire had more cream colored paper. An index of most of the artwork is included. 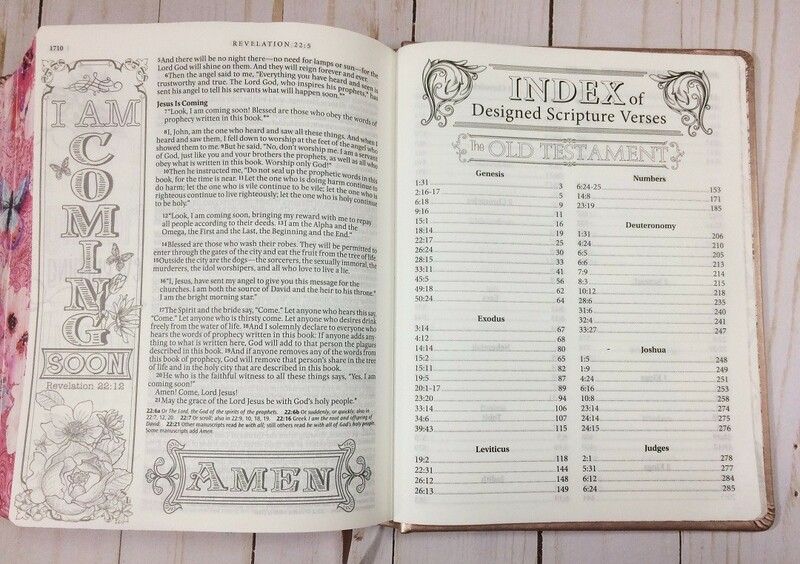 Not only is the index handy for finding the illustrations, but it’s pages are also a good place to test any art products you aren’t sure will work well in your Bible. 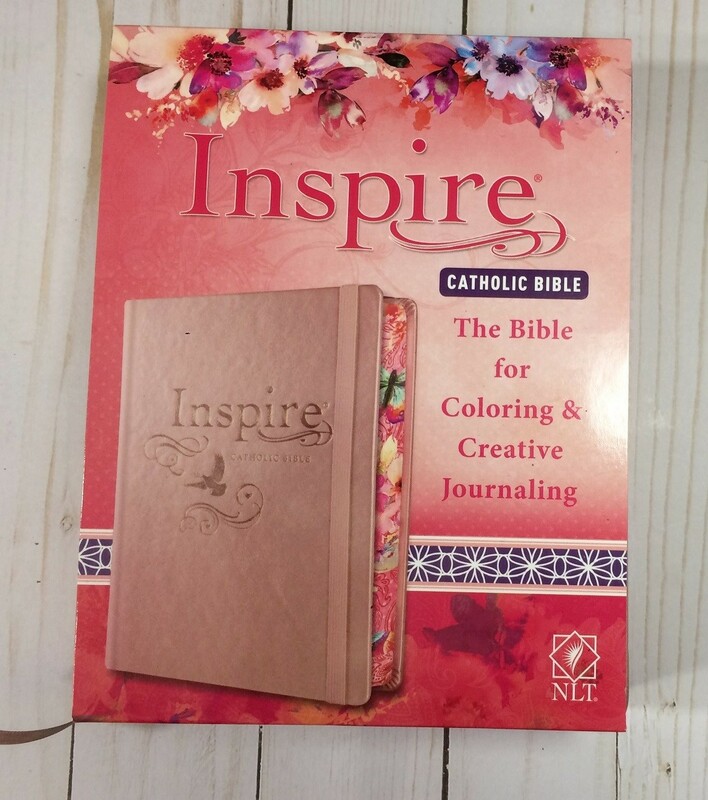 The NLT Inspire Catholic Bible is a beautiful addition to the journaling Bible market. 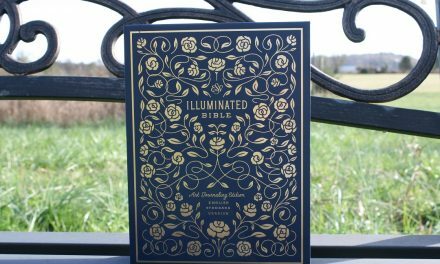 With its thick off-white paper, integrated Apocrypha, and lovely line-art illustrations I’m sure those who have been waiting for a Catholic version of an art journaling Bible will be very pleased.